Home Costs > How Much Does an Air Conditioning Coil Replacement Cost? How Much Does an Air Conditioning Coil Replacement Cost? An air conditioner coil is a very important part of your air conditioner as it’s responsible for connecting with the outside condensing unit via a copper lineset and will complete the cooling circuit of the refrigerant in your system as it’s being circulated by the compressor. Over time, these coils may be damaged due to some factors such as a refrigerant leak, dirt buildup, corrosion, and/or normal wear and tear. Whatever the cause, a damaged coil will either make your air conditioner work harder or it may not work at all. Coils, without any professional labor, can cost anywhere from $150 to $400, but when you factor in the professional installation, it is safe to budget anywhere from $800 to as much as $1,900. The costs will depend on the size of your air conditioner unit, its efficiency rating, refrigerant type, brand name, the professional you use, where you live and if a warranty is involved. Since all jobs are different, consider getting an exact quote for free from multiple licensed contractors in your area on HomeAdvisor.com. The price estimate mentioned above may or may not include additional parts such as a new drain line pipe, copper fittings, miscellaneous sheet metal and/or a refrigerant recharge. A good contractor, before you hire one, will provide you an itemized list showing you what you will get with your quote. HeatingAndCoolingWarehouse.com, for example, offers the prices for the coils only. A two-ton coil, for instance, is priced around $239, whereas a 2.5-ton coil costs $259. A 5-ton coil can cost about $500. As expected the price goes higher as the unit size increases. Again, these prices do not include the installations costs. On Angie’s List, one member asked what it would cost to replace a coil, and the person who had asked the question stated they were charged $1,200 for the entire repair. Wondering if the price was high, professionals chimed in and stated the cost should be in line for a higher cost of living area. One reply, in particular, said you should always budget at least $1,000 as long as an existing model were available; however, if the new evaporator needed to be modified, the costs could rise to $1,500 or more. This Gardenweb.com forum thread had a member claim she was charged $1,400 for a new coil, or if she wanted to replace the unit, it would cost about $5,000. In the addition of the coil, you may also need additional repairs. This could include a freon recharge ($150 to $300), miscellaneous tubing ($30 to $50), duct insulation ($50 to $100) and/or miscellaneous supplies ($10 to $40). While rare, some cities may require a special permit, but this will depend on the city policy. Most of the time, if you’re just replacing the coil only, it won’t need a repair; however, if you were to replace the entire unit, then there’s a good chance you would need one. 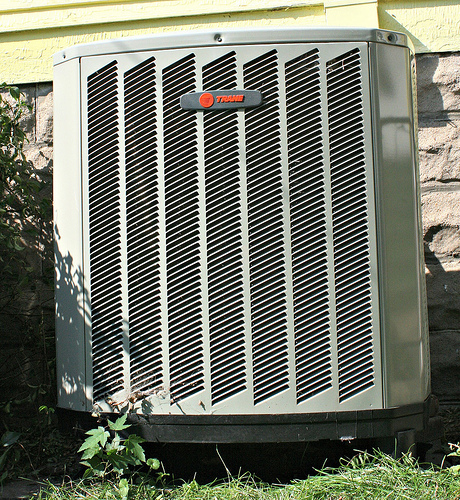 The length to install an air conditioner coil will depend on the complexity of the job. If it’s a simple swap and replace, it can take up to three hours; however, if it’s hard to access the attic and more sheet metal and drain line work is required to fit the new coil, it could take up to eight hours to perform. A common sign of a bad air conditioner coil will usually be when there’s a puddle of water beneath the unit. Check with your air conditioner company to see if it’s still under warranty. If so, the company will more than likely cover the part, not the labor costs. Depending on your case, it could cost up to $60 to $100 per hour, depending on your geographical location. In most cases, it can take anywhere from two to six hours to install, depending on the complexity of the situation. Even though it may be too late, get in the habit of having a professional come out annually to maintain your unit. These important sessions can free your unit of any soot, dust or airborne particles that may block the air flow, which can eventually lead to failure. Talk with a professional to see if it’s worth replacing the coil. If your unit is older than 15 years old, it may be wise to put this repair money toward a newer system. $175.00 to install a condensate pan float switch now required by law but was not required 4 years ago. $250.00 to recharge the system with R410A. ($25/lb x 10 lbs). Do these charges sound reasonable? Rheem 3 ton 17 inch evaporater coil for AH H10A removal.